A community is not without events, and events don’t host themselves! Events far and wide, no matter whether they’re free or paid, large or small, are really the driving forces behind the communities that they take place in. Without events, any community would eventually dissolve and it would go from being a gathering of people to becoming a spread out population of people that more or less doesn’t care about each other. Events bring people together. It not only lets people come together and compete, build rivalries and friendships, but it’s also an amazing reminder to how friendly the atmosphere is and the level of welcoming and inclusiveness you can find in most skate communities around the globe. For instance, there are many incredibly advanced events in the scene, like Maryhill or Giants Head Freeride, which a large majority of people cannot skate because they are simply above their level. However, attendance from these skaters is huge because many people come to just hang out! And that’s why events are so important. That being said, there are times when there may be a lack of events, or a lack of events that you personally don’t enjoy. I know that for a while in my scene, we didn’t have any parkade events, and that really turned me off. There were so many races at the same hills and paths all the time, but nobody seemed to want a parkade race. Or, in the winter, people may not be hosting events at all because of the weather, when people in reality are hungering for an event all the time. These are the cases when you as a skater and valuable part of your local community, must take it upon yourself to make these events happen. And this is written in the hope that it can help those people in the community step up and make events happen, because it’s incredibly easy when it comes down to it; however, it can be condensed down to several steps. I personally took these steps when I was hosting my first event, and it went splendidly. Step One: Come up with a novel idea. The first thing you have to do is come up with something that is relatively unique. By this, I don’t mean host an event that is radically different from every event that has ever happened in the world, I mean that you should come up with an idea that isn’t monotonous when put against most events that have happened in your scene in the last few months. For example, if there were 2 parkade races in the past 3 months, don’t host another parkade race; nobody will come, since people will get bored and tired of those races. Instead, if there were 2 parkade races, then host a path race, or even host something like a skate community barbeque! 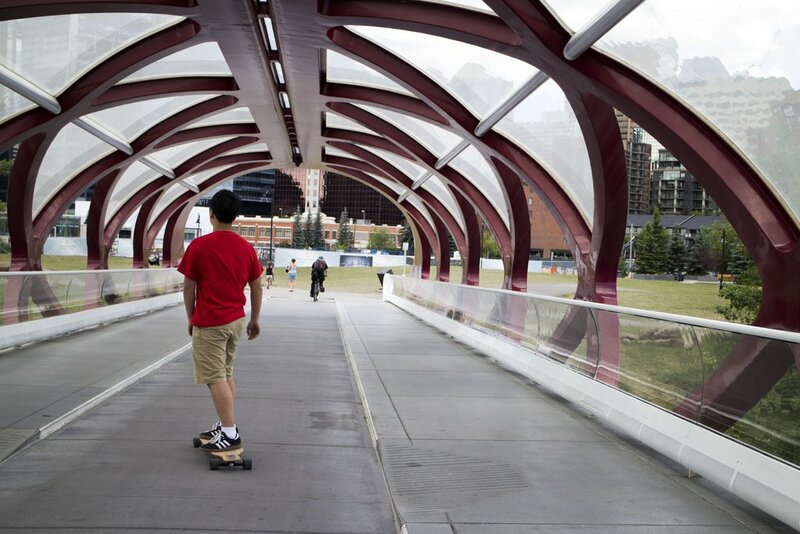 Whatever floats the boat or rolls your skateboard, just don’t make it boring. There are exceptions to this rule though. If for some weird reason, there were several races of the same theme that happened in the past how many months and it’s all your community has to skate, then it is your job to make that event even better. Take a plain cake that everyone used to love and throw some sprinkles on top, make people love it even more. For example, I took a regular parkade event and added the novel idea of challenges, a system vastly different from the greyscale races that just went from top to bottom in race heats and made a simple podium. No, I made them do 13 different races (things such as, tying your hands behind your back, standing like a pencil, buttboarding, etc.). This created an extremely fun and entertaining race, while building upon events that had already happened in the past. Step one finished. Not so hard, is it? Step Two: Have a general idea of how the event will run. Is it a race? If so, then how will you organize the racers? Will you have a registration? How many people per heat? If you have multiple races, will you have multiple podiums? These are some of the questions that you must have answered going into an event. Even if a race does sound like the simplest thing to organize, it really isn’t. You can’t just put everyone on the starting line and make everyone go; that’s ridiculous and hilariously dangerous (although it’s called Chinese Downhill). You have to make competition trees and brackets, and to do this, you need to have a registration of all your racers! It’s not the simplest thing, and you should have a strong, concrete idea of how you will go about organizing your successful race. You should also have a very good idea of how to amplify your unique ideas into your race. A straight race is never fun, you should always have plans to make your event fun and wonky compared to the stuff that people usually do in their free time. Events are where many people come together, take advantage of this and the large number of people to create fun, unique, challenging quirks that will spice up your event! For example, when I was organizing my parkade event, I made sure that we had a backup plan in case we had extra time left. I got together some loaves of bread, and started sending people down in heats where they had to eat as many pieces of bread as possible before reaching the bottom. It was a little quirky addition to an already great event, and it’s something that people will talk about for a long time to come; allowing you to have another repetition of your event in your future. Step Three: Have a driving factor that will push people to come to your event. In the case that you haven’t had the chance to build up a reputation for your event over several years, you’ll need some materialistic things to get people to come to the event. These materialistic things could be things like prizes, or free food, things like that. Once you have these measures in place, it shouldn’t be too hard getting people to come. In terms of prizes, contact your local longboard store for sponsorship opportunities. If your local store is active in the community in supporting events and riders, it won’t be a far stretch to say that they will contribute prizes and items to your event. Some good prizes are wheels, t-shirts, stickers, and sometimes decks, even. I’ve seen big events give away whole setups. Alternatively, you can pool prize money. So, you charge a few dollars per person as admission fee, and then while the event is running, you send someone to get a set of wheels and a few t-shirts. These are your prizes and it will work the exact same way. Sometimes when you do this though, you’ll end up with not enough money for first, second and third prizes. You might have to add some prizes from your own personal stash in these cases. Personally, I keep a big boxes of freebies that I get at events in order to give away as prizes at events. As the date of your event approaches, you’ll need to consistently market your event so that more and more people RSVP. I find that making a facebook event page or something similar always helps, and usually telling friends to invite friends of friends is a good enough number to start you off to stardom. After about two or three weeks of consistent marketing, you should hold your event so that the event date doesn’t go stale in people’s minds. You must keep it freshly hyped and excitable. Event day is here, and you should be on your toes! Make sure everything happens smoothly; don’t forget anything at home, put it all into a bag and bring it to the venue, especially prizes and registration booklets! Be there, be on your best game, and make it happen. Your community will thank you. Always wear a helmet. Ryan Lee from Magneto Longboards. I had the opportunity to test out the new bamboo drop-through a couple of weeks ago, since I’m a rider and writer. I have a lot of thoughts on it, many positive and I am still wondering if there are any negatives to the Long board itself. It is one of the most comfortable cruisers I’ve ever ridden, and even though I am not a fan of drop-through boards, I thoroughly enjoyed the many rides that I have been on with this board. I am absolutely positive that many beginners and experts alike will enjoy the board for everything that it is: A cruising, carving beast of a machine. It’s a minimalistic Bamboo Longboard. I’m not a particularly fashionable or a trendy guy, so I don’t usually buy longboards because of their graphic and color, but I can relate with many when they complement this longboard. It’s natural-looking. It’s just a simple wood veneer on the top and bottom and in my simple eyes, it could go well with anything and make a very good first impression to wherever you decide to bring it. It’s also nice because it was easy to buy. I didn’t really have to contemplate the graphic, unlike what I do with a few different longboards here and there. All you have to do is concentrate on the shape of the longboard and the concave, which are the two actual features of a board that matters. The designers of the longboard really tried hard to open the board up to the eyes of a beginner. The concave is pretty minimalistic as well. This lets any cruiser avoid having bad foot pain on long pushes! It’s just a simple progressive concave and some camber, so really all it does is support the arch of your foot and make it easy to turn. Minimalistic concave such as this are found on many downhill boards as well, so if you ever decide to switch to a downhill board, the concave will be more or less familiar. The grip tape is painless. What I mean about this grip tape is that it’s very mild. It’s sandblasted into the wood, so you get that beautiful veneer on the top of the board showing through, so you can constantly be reminded that yes, you have a high-quality Magneto board under your feet. No joke. Just kidding, it’s just pretty. The advantages of having really mild grip tape are many. For one, it won’t destroy your shoes. I can personally attest to having my shoes eaten up by coarse grip tape that comes with many downhill longboards, and I can also say that it’s a huge burden to my budget. 60 dollars every 3 months is extremely expensive. I can’t personally see my shoes being eaten up by the Magneto board since the grip is so mild. However, that isn’t to say that it is strong enough to hold my feet in place during some extremely powerful carving. I didn’t slip at all. Just keep your feet flat and you’ll be good. I like this grip for dancing as well. Since it’s so mild, it is good for doing pirouettes and crossstepping everywhere since you can move your feet freely. You can slide your feet places with lots of control. Most dancer decks come without any griptape in the middle, but with your Magneto drop through, you won’t need to remove grip tape at all. It’s also very easy to tweak! When your grip does get dull (it happens with every grip tape ever), all you need to do is sand it down, and place a sheet of grip tape over it. Super easy and convenient. I’ll be honest, I don’t like rock-hard decks. Even my downhill setup is slightly, slightly flexible. It’s made of 8 plies as opposed to the normal 9 or 10, so it’s still very dampening and welcoming to stand on. Some boards are made of 10 plies and it’s like standing on a rock for 3 hours. The Magneto drop-through is made of 7 plies. 5 of maple, 2 fiberglass. This makes it extremely comfortable to stand on. As a test, I went on a ride on some of the roughest roads that I could find, and I was extremely delighted to find out that it was healthier on my feet than my regular downhill board is. The thing is, I don’t even push a long distance and my feet usually hurt by the 500 meter mark. That’s on my downhill board. I pushed a kilometer and a half on the Magneto Drop-through and I didn’t feel any noticeable pain in my feet nor in my calves. That’s pretty surprising too; I have flat feet and longboarding itself is painful. The moderate flex also makes the board a natural shock-absorber. If you look at the deck, you can see that the necks where the standing platform tapers off into the mounting holes is quite long. I believe it was designed this way in order to have a lot of torsional flex, which would absorb a substantial amount of the vibrations that would travel up through the trucks into the board. This is probably why I couldn’t really feel the bumps in the road. After the enough time, the dampening effect should increase even further. If you ever wanted to start doing flip tricks to add to the “wow” factor of your dancing, this board may be the one. Because of the moderate flex, it makes landing flip tricks deceptively easy when you are learning the tricks because the flex makes the board feel like a pillow; it catches you and makes sure that you don’t just bounce off of the board as soon as you land. I’ve tried flip tricks with my board, and this has happened before. It isn’t pretty. The board, even though it is quite long, is very slim and compact in every other feature. It’s quite skinny for a cruising board, since cruising boards are usually a bit wider. This allows your toe to slightly hang off the board, resulting in an incredible increase in the control you have over your board. You can also get a lot of leverage in case you ever want to start doing slides and all of that. The skinniness of the board was something that I particularily enjoyed when I was riding it along the riverwalk. Now, in my city, the riverwalk is usually very packed with people. People going left, people going behind you, cyclists, all of that. The compactness of the board improved my maneuverability between all of these people. I found myself effortlessly weaving in and out of the crowds of people, since where other boards would snag and smash into people’s shins and ankles, this board seemed to be immune to those kinds of accidents. The trucks also seem to run a lot lower than most trucks on the market. This means that you can get even closer to the ground than a drop through usually amounts to. This means easy pushing and commuting. Trust me, reaching down from a topmount every single time to push hard isn’t the friendliest thing on your core and calves. The board’s compactness also came to my aid whenever I was carrying it around. Since it is so thin and skinny, I could carry it around the halls of my school with very minimal drawbacks. I didn’t really bump into anyone, who I would have bumped into with my curvy downhill longboard. I saved the best for last. The wheels are a very soft, cruiser-type wheel which accelerated quickly and stopped quickly when I needed them to. I could push them and make them travel for a long time, and yet when I needed to stop quickly at an intersection, they slowed down to a stop almost instantly. This made for some extremely efficient commuting times. I could speed the block, and then slow down at the intersection, speed the block and just keep going. The versatility of the wheel in terms of speed made it extremely easy to make split-second decisions and still be safe. I did try out downhill on them, and they have a curious use that I haven’t had the chance to explore anywhere else. They are training wheels. By this I mean that the wheels accelerate quickly, and then plateau out into this really friendly kind of speed that doesn’t scare you. From this point, you slowly accelerate upwards into the speedier speeds, but it still does give you time to think whether you want to footbrake or not. They do wear very evenly, which I enjoyed quite a bit. And this is 5 things I loved about the Magneto Bamboo Drop-Through. WEAR A HELMET, MAKE SMILEY FACES. Ryan the Longboarder.